Back in May I attended the Marchesi Di Gresy wine tasting at the Barrel Thief and got to meet the winemaker, Alberto di Gresy himself. A couple of nights ago we had one of the wines that we purchased there for dinner to accompany our Tofu Parmesan. The wine was the 2006 Marchesi di Gresy Nebbiolo Martinenga priced at $30. 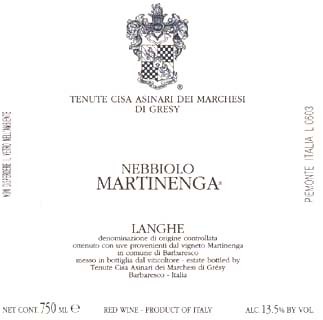 The 2006 Nebbiolo Martinenga comes from the same single vineyard that Alberto’s famous Barberesco Martinenga comes from and is some of the same grapes, but does not go through the obvious DOCG requirement for Barberesco labeling. Martinenga’s 29 acre vineyard combines ideal Southern exposure with blue marl soil to provide excellent growing conditions, evening in difficult vintages, for the Nebbiolo grape. It went nicely with the tofu parmesan, although not a meat dish, the slight crisp mozzarella cheese and fresh shaved parmigiano reggiano faired nicely with gripping tannins of the wine. Very nice balance of fruit and earth, none of which were overpowering, just present enough to notice. I should have decanted this for a couple of hours, which would have hopefully smoothed out those tannins a bit, or should’ve held on to it for another year but I just couldn’t wait. Great chance to save a few bucks off the Barberesco price and get a really awesome quality Nebbiolo, I highly recommend it.